The titles listed below are connected by a theme of identity and BELONGING. Compassion and empathy filter throughout each of these picture books, whether the narrative is about war, the refugee experience or finding a place in a community. One (or more) of these titles) should be strong contenders for Caldecott award. Marwan is bound for a place he doesn’t know and he relies on the memories of his faraway homeland to give him courage and hold on to dreams of a peaceful place to live. “Marwan, keep going, walk, and walk, and walk. “I want you to be proud of your people,” TJ’s Daddy always say. Inspired by true events set in the destruction of war, this poem first published in the Guardian newspaper website alongside an image of an empty chair inspired hundreds and hundreds of images of empty chairs to be posted in solidarity for the 3000 unaccompanied child refugees where were refused sanctuary in the UK in 2016. evokes the experience of a young refugee. Mustafa is awakened by dreams of the war-torn country he used to live in. But now, the young boy is settling in to new surroundings and coming to find comfort in a new place. “If you were invisible, I couldn’t hug you, could I?” answered his mama. The author of this book, a poet, artist, and activist was the son of migrant farmworkers. 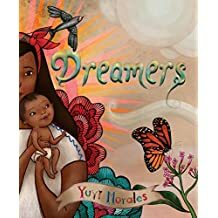 This picture book illustrates Herrera’s poem ‘Imagine’ about a young boy’s search for achieving dreams and finding a place of belonging. Awaiting a journey in search of a new home, a Syrian father tells stories to his son, remembering a happy life that preceded a time when skies spit bombs. Many children, because of war and conflict are forced to leave their homes because they are no longer safe? Will they find someone somewhere who will welcome them into a new home? Simple text, direct questions, powerful photographs make Where Will I Live? a thoughtful read. Inspiring words of activism are spread out in alphabetical order. A bleak wall is transformed by friends and neighbours into a place of story and color and celebration and joy. What’s it like to find yourself in a place where you feel different because of the way you look, the way you dress, the way you eat, play, speak? What is it like to share your stories that may be different or similar than the one’s others have? Dreams can come true about a new life, in a new country, speaking a new language and learning to read.